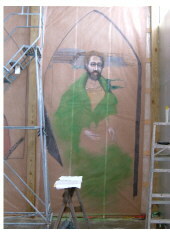 The project is two accoustically translucent paintings. The final works must be accoustically translucent because they hang in front of existing speakers within a cathedral that is undergoing major remodeling. The person in a few of the pictures is Karen, my second oldest daughter…she’s in there because it’s her digital camera, and I needed a person in the picture to show scale—she’s 5’5”. The pictures require some imagination, because the vertical lines you see behind them are pieces of masking tape on kraft paper behind the paintings. Kraft paper is part of the construction technique. The paintings are “cartoon”ed on the kraft paper for my reference. That allows me to keep scale right. You can imagine painting 2 feet away from something that is this size is difficult to keep an idea of the entire painting at once. 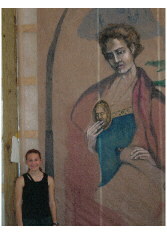 You see that masking tape because it is touching the paintings from behind. You won’t see tape or anything else if it doesn’t touch the surface from behind, or isn’t lit from behind. The paintings will seem a little less “brown”—that’s the effect of the Kraft paper. The first phase was a series of sketches and paintings passed to the customer to reach agreement on concept, sizes needed and likely cost. The paintings are representational, but not final in composition. The colors in the paintings only suggest the final colors, the intensity of the colors is not attempted. 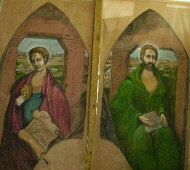 Notice that Simon and Jude are based on some icons depicting the pair. Watch the sketches in later phases as the models change. 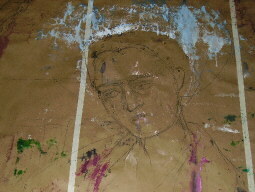 The second phase was scale drawings of both paintings sent on to the customer, and further refinement of painting composition and expression on each face. At this same point the "cartoons" were created. 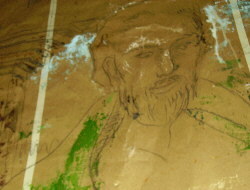 Cartoons are charcoal sketches to scale done on Kraft paper to allow the first full size representation of the works. The cartoons will later be used to hang behind the paintings in work to allow the artist to reference them for scale concerns. Notice that the models for Simon and Jude have both changed. Simon is an aged version of a 20 something I know. Jude is a fiction, I've just given him a character. The painting begins. Some quick work is done to bring a sense of the work to life. This work focuses on the faces and hands and serves two purposes: 1.) 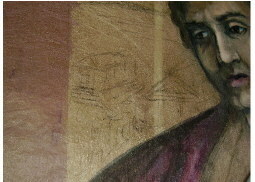 the customer needs to have an idea of the final quality of the paintings. 2.) the artist is nervous---a natural thing at the beginning of work. Notice that the model for Simon is the same, but I've softened the features. Simon eventually had three models, and is a mix of these three with the primary model being the 20 something man I mentioned earlier. You can see in the earlier paintings that the paint for the sky behind Jude’s head is wet—it’s sticking to the kraft paper while it dries. You can see a square of paper to the side of each painting—those are the sketches the customer saw the scans of. You can see a large amount of open books and papers on saw horses—those are the encyclopedias I’m using for reference for detailing ideas. A couple of times,wrapped up in painting, I've stepped back to get a perspective on the project--only to catch myself before I fell off the ladder. I've started to keep my drinking water a stretch away, because I've accidentally used it for the paint brushes too many times. The paint in these paintings will cost about $200. Most non-artists would be shocked at the "high" cost. Any other visual artist would be astounded that this was so little. 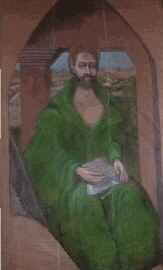 The explanation is that the painting is "dye style" (similar to water color). Thus all paint is heavily diluted in most spots. Jude's epistle will be papyrus. 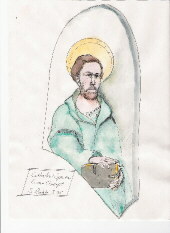 Simon's papers will be vellum (thin translucent animal skin used for paper). Simon's paper originally were to have no text. To my knowledge no writings of Simon survive. My hardest task is keeping the paintings stylistically similar. My background and what little training I had in art focused mostly on set design. Set designers are by nature imitators and tend to be very fluid in styles. So I found myself painting Simon in one style and Jude in another—and even if I liked the product, I had to go back and change them to make them stylistically similar. Jude now has gotten his final model. 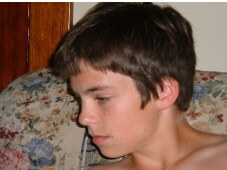 Jude is loosely based on a 15 year-old boy. Jude is a version of a 15 year boy aged another 17 years. The boy (my son) is shown in Phase VI section of this page. Aging characters that amount is an inexact science, but lengthening the nose, strengthening the jaw and adding the characteristic male "ridge" to the forehead is the logical start....besides I used his father's forehead in the painting. Again a fair bet. 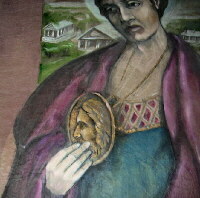 Simon would not have papers as likely as scrolls, Jude would likely not have had a metal chain to hang the portrait of Christ around his neck. I’d suspect he had a leather thong. There will be a small amount of gold trimming on Simon’s robe, which he probably could not have afforded. Mountains in the distance exist in Iran, which is believed to be where the apostles preached at the end. The building they are shown in is based on an old painting of an Iranian temple of 100 AD, so the architecture should be close. The decorations in the arches (not shown) will be from Persia (Iran) before 100 AD. 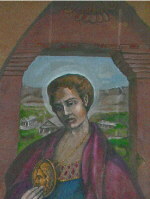 Traditionally the pictures of martyrs have the instrument of their deaths hidden in the picture. These have those and hints of the traditions of each saint. 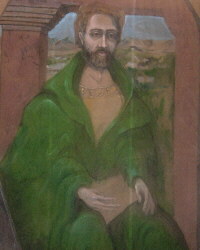 In this case the medallion around Jude’s neck, the scroll on Jude’s lap, the backgrounds of the paintings, the colors used for each saint are either traditional or hint of the legend of each. The choice of the word "legend" is careful. There is very little acknowledged about these two gentlemen as fact or accepted tradition, but there is a legend of a their efforts in Persia that led in some reports to their death. That is only a "legend", but frequently legends are based on fact. Backgrounds have been added to the paintings. The pillars shown are from an ancient painting of a temple in Iran. The pillars are terracotta. 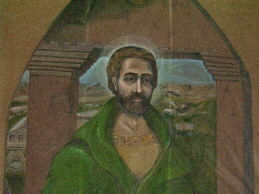 The use of a temple is symbolic of the "legend" of St. Simon and St. Jude. The text of Simon's Epistle 1:21 was added, the text shows as crooked where it goes over the wrinkle of the papyrus scroll. The shading that will allow people to understand the wrinkle has not been added. The text is all caps Greek. Greek from 0-100AD was considered to be "modern Greek", saving me some time in research. The text is consistant with ancient texts in several ways. The spacing is similar, the number of characters per line is similar, the missing accents (important in Greek) is typical of ancient texts, and the missing spaces between words is typical of ancient greek manuscripts. 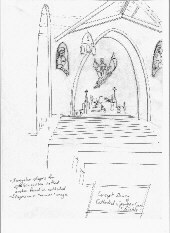 I'm debating the decoration of the top of the arches shown in the pictures. I'd like to add the highly symbolized eagle I've seen in iranian temple decorations, but fear it will be associated with a different eagle used on uniforms. I'll probably finish the details of the top more plainly. 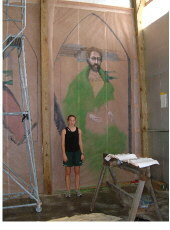 The paintings are kept synchronized by painting them side-by-side together. The robe of Jude is now complete and shows a richer, but thinner fabric. It would be correct that the fabric was thinner, but unlikely that it'd be this color (too close to the color of kings), but I've kept the color for a symbolic tie to royalty. Jude's left hand has been moved to a more anatomically correct position, the hand is show in the light and greatly foreshortened. 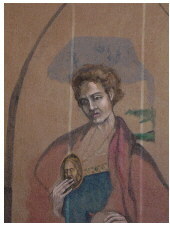 Jude's medalion that shows Christ's face has been changed to the traditional protrayal of a profile. The change to the medallion also solves a compositional issue. The scroll now is nearing completion. The shadow showing the bend in the scroll now shows. 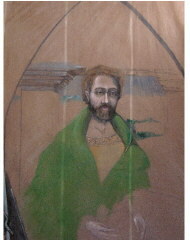 The only progress on Simon is a set of notes (in charcoal on the surface of the painting, showing where shadows and folds of his robe will fall. 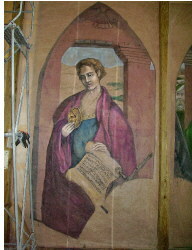 You can notice that the shadows on Jude are pretty much complete, but its conspicuous that one part of the scroll is not finished. This is artist indecision. That part of the scroll overhangs the frame--part of me wants it stay over the frame, the other choice is to hack it off. Ummmmmm. The focus has shifted to Simon. 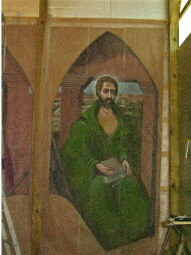 The robe of Simon is now complete and shows a richer, volumous fabric. Simon's hands are more defined. The background of the city is loosely based on Tehran. The accuracy of the buildings seems somewhat appropriate given that the basic style is a Greek style. 60AD was shortly after the Hellenistic period in Persia. In the Hellenistic period there was a mass immigration of Greeks into Persia. Thus the lingering portions of Greek architectural styles that can be seen even in Tehran today. Attention is now being given to framing the paintings. The frame is important for aesthetics, but more so for wear. A frame will collect the dust that would land on the paintings. Thus wear and tear is prevented by allowing dusting of the frame--not the paintings. The wood has been sourced, the frame design concept is complete...the only remaining issue is the shipment. If possible I'd prefer to ship the frames assembled, however in the least they need to be shipped in 12' lengths. The frame design uses a thin oak in plank form. Originally bending of the frame was planned by use of steaming the wood, but this form will allow the wood to be bent over the space of a week without a steam box. Had a steam box have been needed, the process could have taken weeks. At left is Tom, who was aged 17 years to be Jude. You'll notice the other differences...Tom doesn't have brown eyes, or curly hair or a cleft chin. Simon's "papers" are at last complete. 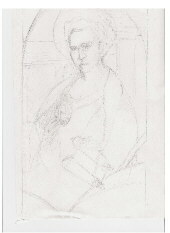 The vellum (paper would have been vellum) is scattered across Simon's lap and is partly shaded. There is a very small amount of text on the vellum, and the words won't be legible to the congregation. 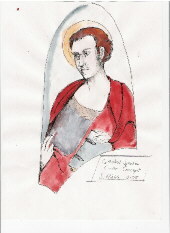 The three words on the vellum are in Greek and are 'Jesus', 'Christ' and 'God' in that order. Of course they are printed upsidedown. I debated for a long time whether to leave Simon's papers blank because none of Simon's writings survived-- to my knowledge. But the stack of blank papers seemed wrong, and so the only words to scatter across the page seemed to be ones to indicate Simon's beliefs, thus "Jesus Christ is God." We are now getting close enough to finishing Simon, that I took a look behind the painting for the first time, just to make sure we hadn't gotten the painting opaque...visually opaque painting would muffle the sound as well. I breathed a sigh of relief when I could see right through it. The background for Jude is in work. A correction is being made to narrow the left hand column. Corrections are tricky, but this one is possible. You can see the charcoal backgrounds sketched in. That same shot also shows a neat detail of Jude's face. The style has evolved to be almost like a fresco. The tan background only enhances that feel. The background of the city is loosely based on Tehran. Just like Simon's. Simon's face has been made slightly more careworn. Above Simon's head in the doorway is a hint of a decoration. That decoration is the tail and hind leg of a lion. The original decoration was part of Persepolis the ancient capital of Persia that Alexander the Great burned to the ground. Above Jude's head in the doorway is a hint of a decoration. That decoration is the bottom of a decoration found on a ruin in Iran. I believe it is a stylized eagle. 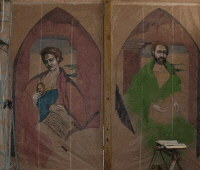 The paintings are still being worked side by side. 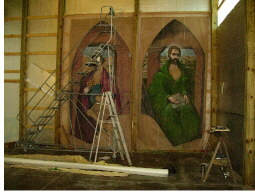 Despite the ladder in front of Jude, you can see that the paintings now much more closely match. The background for Jude is nearly done. The right-hand column is corrected. Looking closely you will see a complete change to the decoration around Jude's shirt. The cartoons that still hang behind the paintings are important. We'll save them for 10 years in case the paintings need to be recreated. 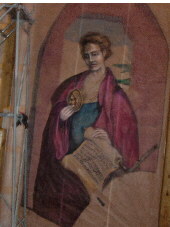 Corrections have been done to Simon's clothing to make the position of his body underneath the robe seem more natural. The closeups show the final decoration of Jude's shirt. Both halos are believed correct. This can only be seen when the paint is dry. The finished halo created a problem with the roof top nearest Jude's face. This is a great example of the type of adjustments that must be made while in work. You can see a close up the medalion. The paintings now are backed with black cloth, that allows the colors to be less tan toned. The masking tape lines are also not visible anymore. The frames are mostly bent, the wood now will have to dry before finishing.